No corny statements about how quickly Christmas has come this year.No, none. Only cake. 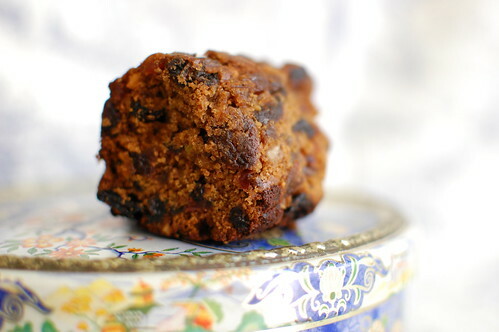 A fruit cake. The likes of which I’ve never made before. Dreamt of making….yes but one of those dreams which die hard and early. 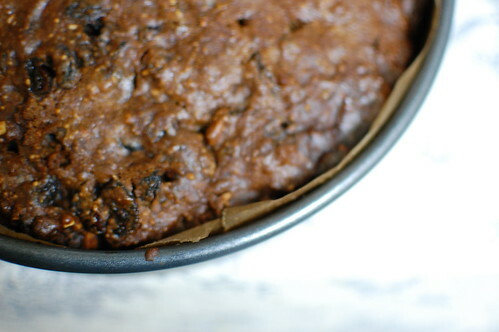 I grew up with Fruitcakes every Christmas, lovingly made by Mrs O, a friend of my mum’s. A master baker, she would start her preparations months before the cakes were delivered, gratefully received and devoured. But I? I have days to spare (with no reference whatsoever to my opening lines). 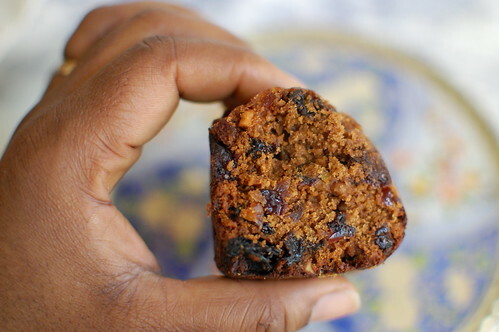 I have decided that we will and we must take a fruit cake with us this Christmas on our travels. In the last few months, I’ve escaped a hammer thumb and acquired ‘cardboard brown’ fatigue. Considering all the nailing I’ve done, the pictures hung up, I’ve been pretty lucky. I know where most things are….and it was in the process of acquainting myself with the contents of my living room drawers that I came across the Good Food Magazine’s ’80 Best-Ever Recipes’ from 2009. I flicked through the pages, sure there were no gems that would interest me. What a lie – this small booklet woke me up, at almost midnight! 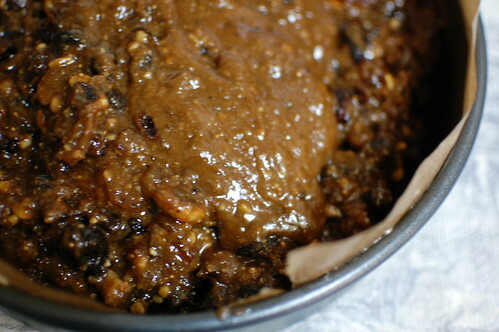 It is called ‘The Simmer and Stir’ Christmas cake, one that will keep in a cupboard for 3 months and in the freezer for 6. And it is December 9th. I’ve only just decided this is the one….for the 25th. In between, there are parties, a weekend away and lest I forget….there is work. You know, that thing I do that makes everything else possible. I peruse the recipe and all its cardinal points, and then slowly map out my version. I consider adding a veggie sweetness and moistness with left-over pumpkin puree. I consider marron glaces (candied chestnuts), which for the equivalent of 10 euros and 5 minutes walk, I can be the proud holder/owner of a box. 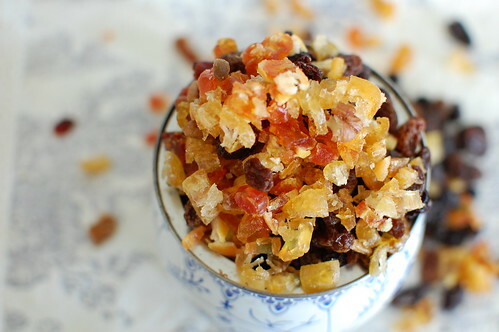 Then my mind wanders to candied peel. And by the time I’m done, I’m weary and the cake has not even been begun. 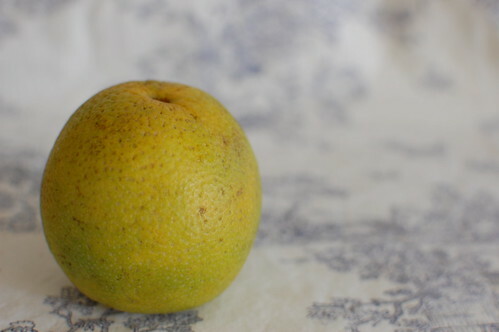 Its then I remember some dried fruit I’ve had for ages – whole kumquats and tamarillos. I feel better already, I’ll not be buying many things after all, using up old stash. Suddenly, I feel good about being less wasteful, feel energized to get to work. Thankful too that 14 days before we board a plane, I’ll have made a cake. And will travel, tin in hand. I had to get some ‘oranges’. Which in Nigeria don’t quite have the Valencia orange skin on the outside. Imagine the utter shock for my kids when we arrived in August and I gave them some oranges. They were totally confused by the lack of Orange colour. 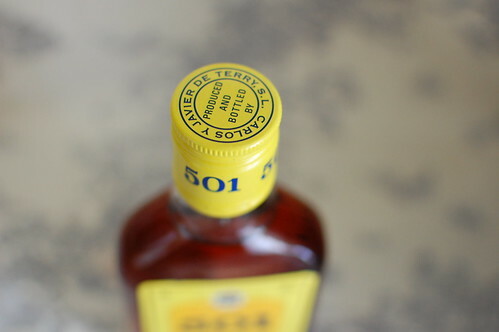 On the inside though…..there are hints of the warming hues…and the taste isn’t much of a deviation. the ‘orange’ is somewhat orange inside, don’t judge a fruit by its peel! This is an EASY cake for the stunning results it gives. It tastes EXACTLY like the cakes Mrs O made. My only regret? Not making one to send to my mum! Even if I made this on one of the busiest Saturdays in my life ever :-). The recipe was straightforward. 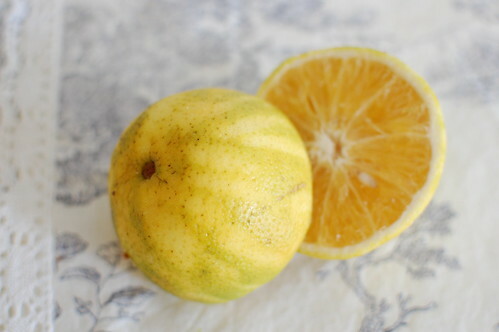 Fruit, brandy, sugar and butter in pan, along with fragrant citrus zests…..simmer. Stir. Other ingredients in pot. The brandy smelt heavenly, like liquid mince pies….and so my excitement doubled. So much that I neglected to compare the size of my baking tin and my planned storage tin, which I was intent on using. I went for the hotter end of the spectrum when it came to ‘spicing’ the mix up. Cardamom powder – freshly crushed seeds, 3 shakes of the powdered ginger jar and half a teaspoon of vanilla powder. But my absolute favorite part was when the fruit, fresh from simmering plumped up and glossed over, shiny with promise. I was so tempted to scoop spoonfuls and ladle over vanilla ice-cream. But I resisted admirably, didn’t I? The cake went in the oven. Baked. Cooled down. And then it was time to prepare for storage. Just at the point were I was getting so nervous about waiting weeks to have a taste. 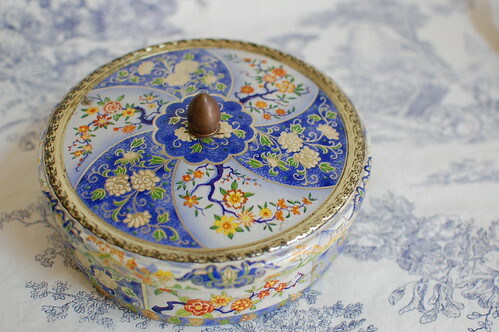 So I cut out a small circle that slid into my gorgeous blue tin, once wrapped. That left a few pieces to ‘test’/quality control as I call it. Yes. No need to wait for the ‘proof’ of the pudding, an entire 14 days away. Especially painful for me, I am all for instant gratification! It was day one but the cake held its own. Many reminders of Christmases past, held together by almond meal and white flour. And proudly, when I sliced it, there was no disappointment, no senseless crumbling, no falling apart. Just deliciously fruity cake. Pure and simple. 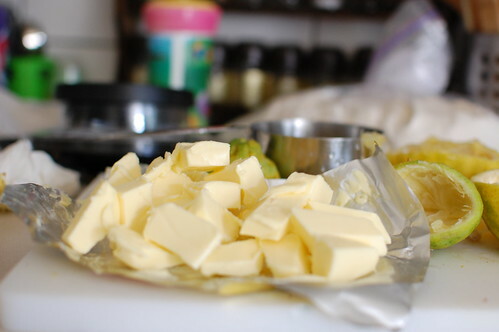 Put the butter, sugar, fruit, zests, juice and 100ml of brandy in a large pan. Bring slowly to the boil, stirring until the butter has melted. Reduce the heat and bubble for 10 minutes, stirring occasionally. Meanwhile, preheat the oven to 150C/Gas 2/Fan 130C and line a 20cm round cake tin. When mixture has cooled down add the eggs and ground almonds and mix well. Sift the flour, baking powder and spices into the pan. Stir in gently, until there are no traces of flour left. Spoon the mixture into the tin and smooth it down evenly. Bake for 45 minutes, then turn down the heat to 140C/Gas 1/Fan 120C and cook for a further 1 – 1 1/4 hours (about a further 1 ¾ hours if you are using gas) until the cake is dark golden in appearance and firm to the touch. Cover the top of the cake with foil if it starts to darken too much. To check the cake is done, insert a fine skewer in to the centre – if it comes out clean, the cake is cooked. Make holes all over the warm cake with a fine skewer and spoon the extra 4 tbsp of brandy over the holes until it has all soaked in. 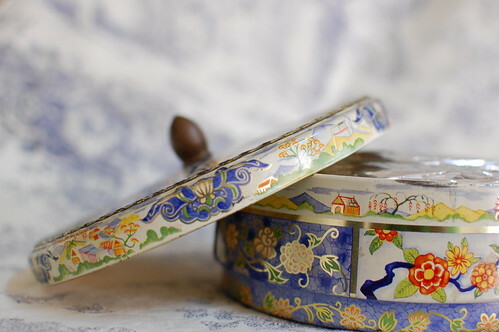 Leave the cake to cool in the tin. 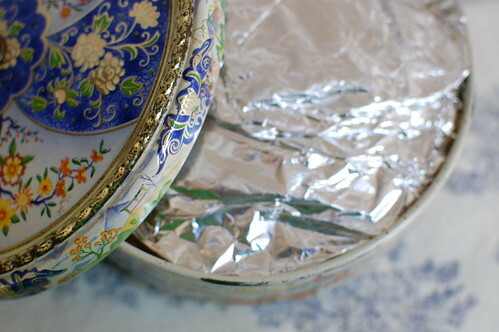 When its cold remove from tin, peel off the lining paper, then wrap, first in baking parchment or greaseproof paper and then in foil. Whatever you do, I hope you have a fantastic Christmas season.